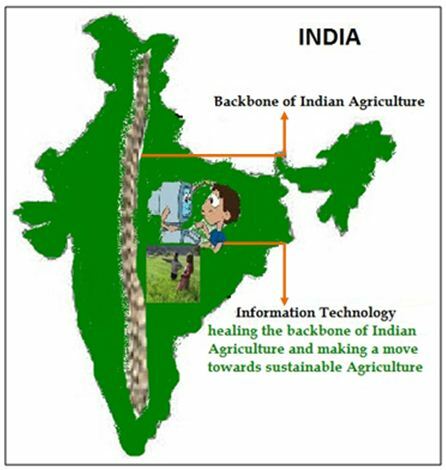 Agriculture is back bone of India. With time, the reality is changing. Given an option the farmers are ready to quit agriculture is a hard reality .Time has come to heal the back bone of Indian agriculture by understanding the bane of Indian agriculture .Certainly! The bane of agriculture is not the lack of R&D and technologies but the back bone is weakened by the inadequacy and inefficiencies in the dissemination of relevant information to the farming sector. A significant size of land holding lies with marginal and small scale farmer. Information Technology (IT) is the sole efficient option left for communicating agricultural information and knowledge to marginal and small scale farmers. It can further help in providing viable linkages and efficient supply chain management thereby improves business information and knowledge to enhance market access. Indeed ! Information technology is an efficient tool for sustainable agriculture.